A huge collection of bright, bold, up-front patches. You'll certainly get plenty of mileage out of WaveRunner's lovingly curated archive of classic sounds. Waverunner X synth. Lots of ground covered. Expensive. Some may find it too old school. 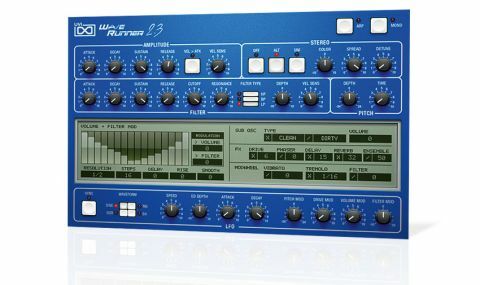 Drawing on over 30,000 samples from a range of classic wavetable synths and drum modules (the PPG Wave 2 and 2.3, 360 and Waveterm, and the Waldorf Microwave XT and Rack Attack), WaveRunner continues UVI's ongoing mission to capture the entire history of synthesis in soundpacks for its mighty UVI Workstation standalone/plugin playback engine. "A huge amount of sonic ground is covered"
Divided into seven separate instruments, a huge amount of sonic ground is covered, although the interfaces at the front of each one obviously share many features: LFOs, envelopes, effects, step sequencers and so on. It's also worth noting that you don't get any sort of actual wavetable synthesis functionality such as wave scanning - these are just multisampled patches from the aforementioned synths. Terminal D, a step sequencing drum machine, and Terminal U, a Waveterm-inspired three-track phrase sequencer, are both packed with spangly digital sounds from an array of sources. WaveRunner 360, being based on the oldest machine of the lot, is the grittiest in the collection, and includes 30 of the PPG 360's raw factory waveforms. WaveRunner 2.0 and 2.3 are perhaps the most sonically familiar of the seven, serving up between them a wide range of basses, pads, keys and more; while Orange has a generally harder tone, particularly when it comes to basses. Finally, WaveRunner X is a dual-layer subtractive synth that uses an extensive list of raw waveforms from the PPG Waves as fuel for its oscillators. Once you've exhausted the possibilities of the rest of WaveRunner, this particular instrument is the one you'll find yourself coming back to, and rightly so, as it sounds fantastic. Obviously, the overriding flavour with WaveRunner is distinctly retro, and given that vintage digital synths date themselves more obviously than analogues, some might find much of it too old-school.